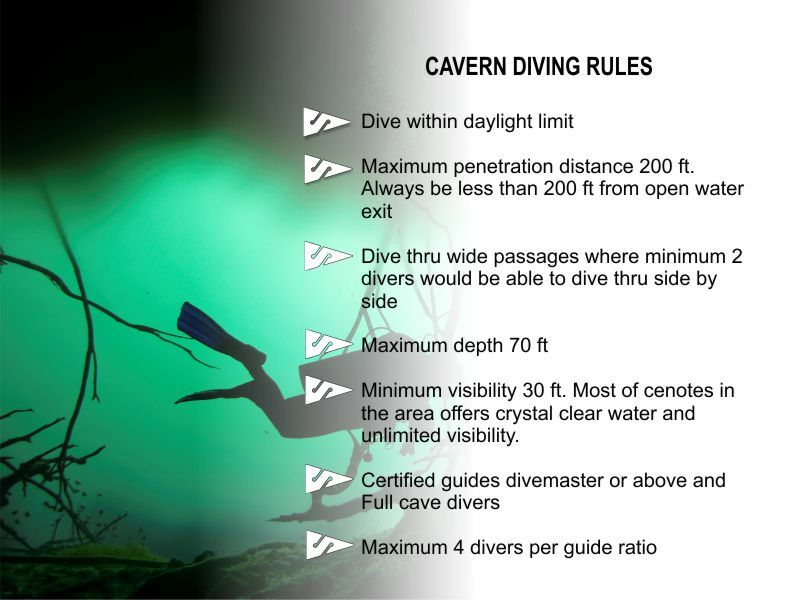 Cavern diving is easy and safe following very simple rules. Only open water license and some dive experience required. It’s true, we are passionate about diving in cenotes. His incredible light, the fantastic decorations of stalactites and stalagmites, the feeling of weightlessness, their haloclines…al this factors make it a dive not to be missed. For the highly experienced divers, diving in cenotes is a way to discover diving again as it was for the first time. The cenotes were formed millions of years ago, due to the limestone platform below Yucatan Peninsula. The filtering of carbonic acid created underground rivers that once connected to the sea became dry caves.For millions of years stalactites and stalacmites were formed inside this caves. In the last glaciation era the cenotes became flooded again, turning them into unique natural environments for diving in the world. There are many kinds of Cenotes, fresh and sea water, shallow or deep, white or dark, suitable for all kind of divers from beginners to the most demanding photographers. Everyone can dive in cenotes, no need any cavern specialty certification. You just need a little experience. We evaluate your diving level and choose the right one for you, a check dive in the sea might be required depending on your experience. Diving in cenotes is safe, we dive in groups of maximum 4 divers per Full Cave certified guide. Our guides have extensive experience in this environment. Maximum penetration distance inside the overhead environment 200 ft.We can be out back in open water in less than a minute. We also organize private dives for underwater photographers, for those who need more time to make the perfect shot. And if you love this world, we offer technical diving courses to get your Full cave certification in the best place for cave diving in the world. How is diving in cenotes?. Cenotes are in the jungle. We get there in vehicles equipped with air conditioned. Cenotes are 30 minutes to 1 hour and a half driving distance from Playa del Carmen. Double tank in Cenotes and back in Playa del Carmen 2-3 pm. 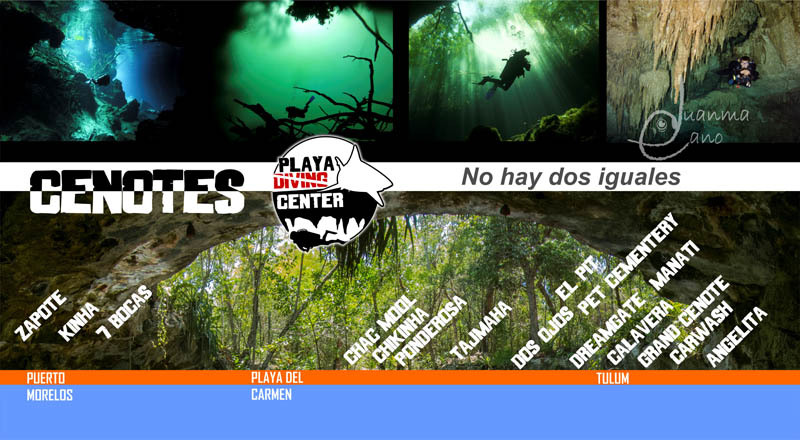 We dive all cenotes in the area: Chac Mool, Chikinha, Ponderosa, Tajmaha, Dos Ojos, Dream Gate, Manati, The Pit, Pet Cemetery, Grand Cenote Calavera, Carwash, Angelita, Zapote and much more.